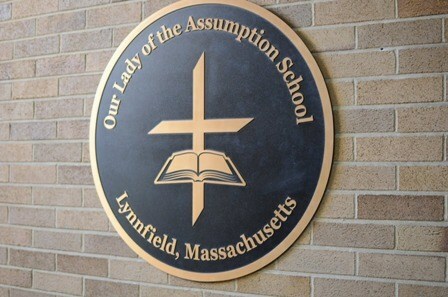 Our Lady of the Assumption School is a Pre K - 8 Catholic school in Lynnfield, MA, right where Routes 1 and 129 meet. Our focus is the total development of the student through academic excellence and spiritual growth. Our Lady of the Assumption School was founded by the Sisters of St. Francis of Philadelphia. Built in 1961, it fulfilled the lifelong dream of Monsignor John J. Linnehan. Originally it served grades 1-4. In 1968 it expanded up to 8th grade. Kindergarten was added in 1972. In 2001 the convent renovation finished with the opening of the St. Francis Center and the school added a preschool program. The St. Francis Center is also home to the library and computer lab. Renovations in 2009 added art and music rooms. OLA continues to grow, most recently with the introduction of a full day preschool program for 3 year olds. Students come from more than 20 different communities with Saugus, Peabody and Lynn being the largest. Our faculty includes a full-time Nurse, Guidance Counselor and Education Resource Department.